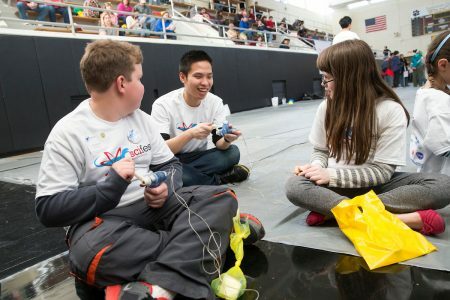 The annual Science Festival is one of the Randolph Society of Physics Students’ biggest events. The Randolph College chapter of the Society of Physics Students (SPS) recently reached a special milestone when it was recognized with an Outstanding Chapter award for the 10th-straight year. Presented by the national SPS organization, the designation honors the group for its activities during the 2016-17 academic year. Fewer than 8 percent of chapters are awarded this honor each year. Leif Kvarnes ’20, one of the current students in SPS, said Randolph’s chapter is all about the people he has worked with and the friends he has made. Thawda Aung ’13, a graduate who now works as a quantitative analyst for Invesco Global Solutions Development and Implementation in Texas, said his involvement in SPS as an undergraduate helped him develop stronger leadership and communication skills. Randolph students built this Mario Kart costume for Charli as part of Children’s Assistive Technology Service’s Hallowheels fundraiser this fall. Some of the most recent projects by the group include building a robot, a space balloon, and two entries in Lynchburg City Parks and Rec’s inaugural Pumpkin Chunkin’ Contest. 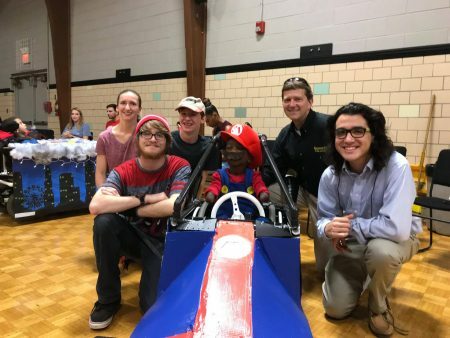 In October, students built a Mario Kart Halloween costume for a child in a wheelchair as part of Children’s Assistive Technology Service’s (CATS) Hallowheels fundraiser. Students in SPS also staff Randolph’s annual Science Festival and host a science jeopardy tournament on campus each semester. Randolph’s SPS received another special honor from the national organization in November. The 2016-17 Blake Lilly Prize was awarded for the group’s community outreach efforts and dedication to physics education.